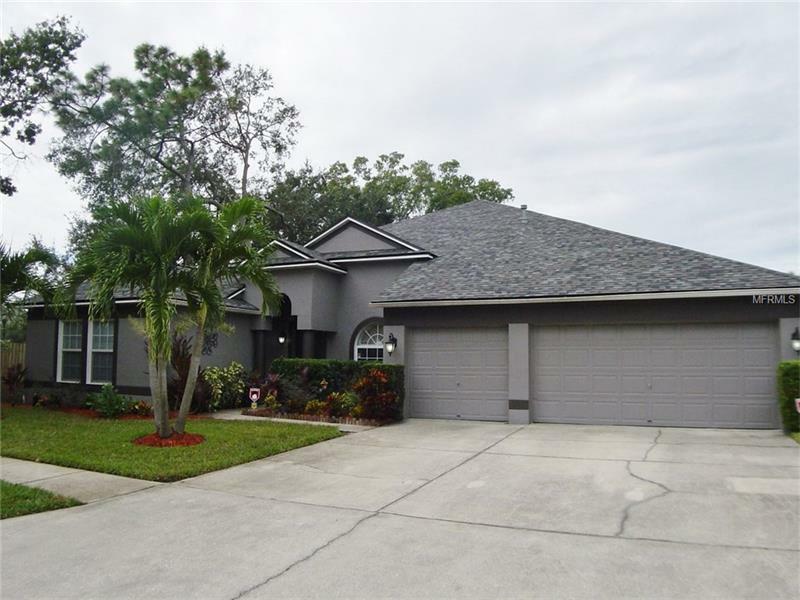 Looking for a NEWER home in the quaint hidden community of Arbor Ridge in the CARROLLWOOD area? This 3 plus bedroom POOL home with a 3 CAR GARAGE sits at the end of a CUL-DE-SAC and borders CONSERVATION in the back and beautifully landscaped in the front. You are going love the OPEN FLOOR PLAN with an oversized dining area (16x09), family room and kitchen with a breakfast bar, breakfast nook, SOLID wood cabinets, newer STAINLESS STEEL appliances with GAS range and more. In addition to the 3 bedrooms, you have a den/office PLUS another room that could be a 4th bedroom, nursery, media room or use for your special needs. Enjoy spending time (poolside) on the PRIVATE lanai with a great 26x8 covered area with plenty of paver decking left over for sunning and grilling. Pride of ownership is evident here. The owners have done most of the updating for you with (all new within the past 2-3 yrs) NEW Roof, A/C, Custom Pool with pavers, 20x20 ceramic tiled floors, exterior paint, stainless steel appliances and more. Other features include: custom baseboards, decorative tile and medallions, art niches and arches, gas appliances, inside utility room and all appliances CONVEY with the property. This home qualifies for our CASH BACK Rebate program when you use our preferred Realtor.